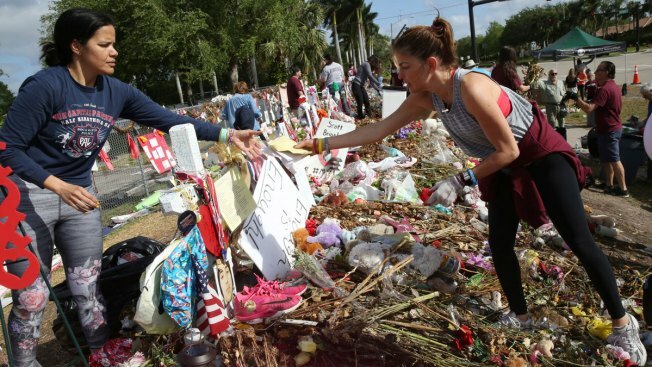 Patricia Padauy, right, passes a handwritten note to her friend Sharamy Angarita, as they clean and sort out items at the memorial site of Padauy's son Joaquin Oliver in Parkland, Fla., Wednesday, March 28, 2018. Gunshot wounds put an average of 8,300 kids into the hospital every year, according to an analysis released Monday. Close to half of them were shot on purpose and another 40 percent were shot accidentally, the researchers reported. Six percent of those who made it to the hospital died, the team at Johns Hopkins University School of Medicine reported. They said while mass school shootings get the headlines, there’s a day-in, day-out toll that adds up to even more, NBC News reported.